The dsp.DyadicSynthesisFilterBank System object™ reconstructs signals from subbands with smaller bandwidths and lower sample rates. The filter bank uses a series of highpass and lowpass FIR filters to repeatedly reconstruct the signal. Create the dsp.DyadicSynthesisFilterBank object and set its properties. 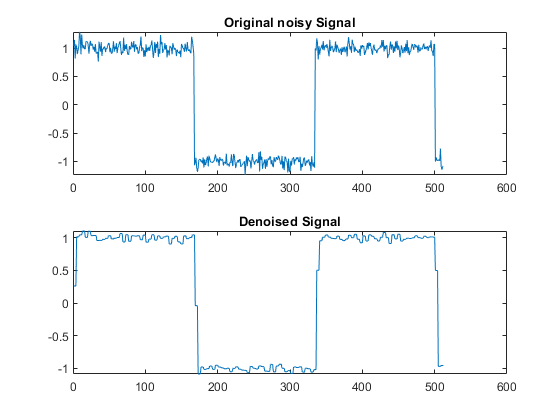 dydsyn = dsp.DyadicSynthesisFilterBank returns a synthesis filter bank, dydsyn, that reconstructs a signal from its subbands with smaller bandwidths and smaller sample rates. dydsyn = dsp.DyadicSynthesisFilterBank(Name,Value) returns a dyadic synthesis filter bank object, with each property set to the specified value. Specify the type of filter used to determine the highpass and lowpass FIR filters in the filter bank as one of Custom, Haar, Daubechies, Symlets, Coiflets, Biorthogonal, Reverse Biorthogonal, or Discrete Meyer. If you set this property to Custom, the CustomLowpassFilter and CustomHighpassFilter properties specify the filter coefficients. Otherwise, the object uses the wfilters function to construct the filters. Depending on the filter, the WaveletOrder or FilterOrder property might apply. For a list of the supported wavelets, see the following table. In order to automatically design wavelet-based filters, install the Wavelet Toolbox product. Otherwise, use the CustomLowpassFilter and CustomHighpassFilter properties to specify lowpass and highpass FIR filters. Specify a vector of lowpass FIR filter coefficients, in descending powers of z. Use a half-band filter that passes the frequency band stopped by the filter specified in the CustomHighpassFilter property. To perfectly reconstruct a signal decomposed by the dsp.DyadicAnalysisFilterBank object, design the filters in the synthesis filter bank to perfectly reconstruct the outputs of the analysis filter bank. Otherwise, the reconstruction is imperfect. The default values of this property specify a perfect reconstruction filter for the default settings of the analysis filter bank (based on a third-order Daubechies wavelet). Specify a vector of highpass FIR filter coefficients, in descending powers of z. Use a half-band filter that passes the frequency band stopped by the filter specified in the CustomLowpassFilter property. To perfectly reconstruct a signal decomposed by the dsp.DyadicAnalysisFilterBank object, design the filters in the synthesis filter bank to perfectly reconstruct the outputs of the analysis filter bank. Otherwise, the reconstruction is imperfect. The default values of this property specify a perfect reconstruction filter for the default settings of the analysis filter bank (based on a third-order Daubechies wavelet). First order: '[1/1]', '[1/3]', or '[1/5]'. Second order: '[2/2]', '[2/4]', '[2/6]', or '[2/8]'. Third order: '[3/1]', '[3/3]', '[3/5]', '[3/7]', or '[3/9]'. Specify the number of filter bank levels as a scalar integer. An N-level asymmetric structure has N + 1 input subbands, and an N-level symmetric structure has 2N input subbands. Specify the structure of the filter bank as Asymmetric or Symmetric. In the asymmetric structure, the low-frequency subband input to each level is the output of the previous level, while the high-frequency subband input to each level is an input to the filter bank. In the symmetric structure, both the low- and high-frequency subband inputs to each level are outputs from the previous level. y = dydsyn(x) reconstructs the concatenated subband input x to output y. Each column of input x contains the subbands for an independent signal. Upper rows contain the high-frequency subbands, and lower rows contain the low-frequency subbands. Data input, specified as a column vector or a matrix. Each column of input x contains the subbands for an independent signal. Upper rows contain the high-frequency subbands, and lower rows contain the low-frequency subbands. The number of rows of x must be a multiple of 2N, where N is the value of the NumLevels property. Reconstructed signal, returned as a column vector or a matrix. The object only receives data as a vector or matrix of concatenated subbands.